With blue and yellow star. If you wonder where they are. 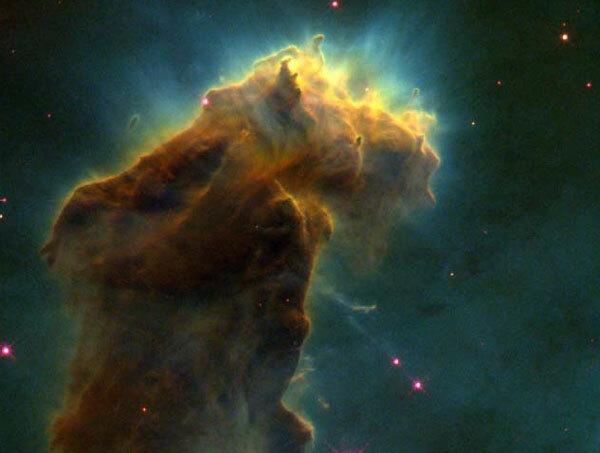 Ten millions of light-years away. its central star a must. To show off all its dust. 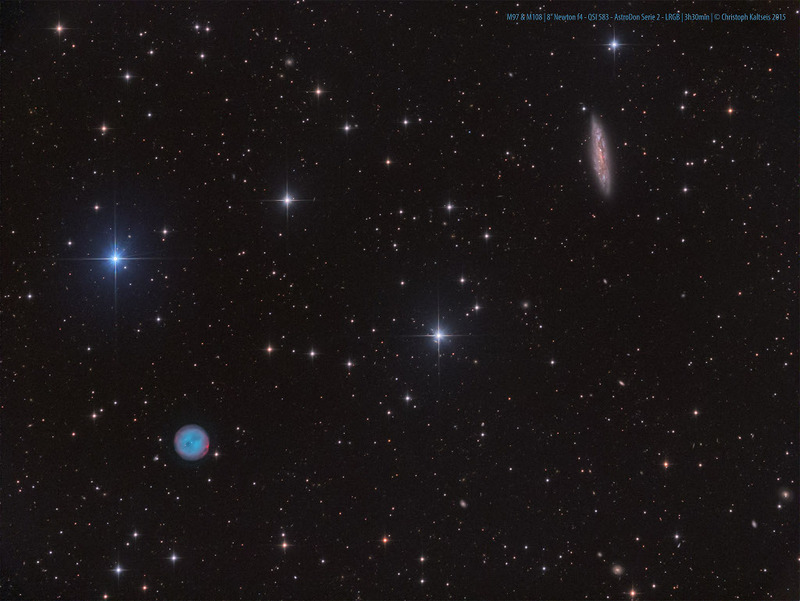 A bright pair of sky objects will be visible together during the next few months. Mars will shine brightly in its familiar rusty hue as it reaches its brightest of 2014 next week. The reason that Mars appears so bright is that Earth and Mars are close to each other in their long orbits around the Sun. Spica, on the other hand, shines constantly as one of the brightest blue stars in the night sky. Pronounced "spy-kah", the blue-hued star has been visible throughout human history and the sounds that identify it today date back to ancient times. 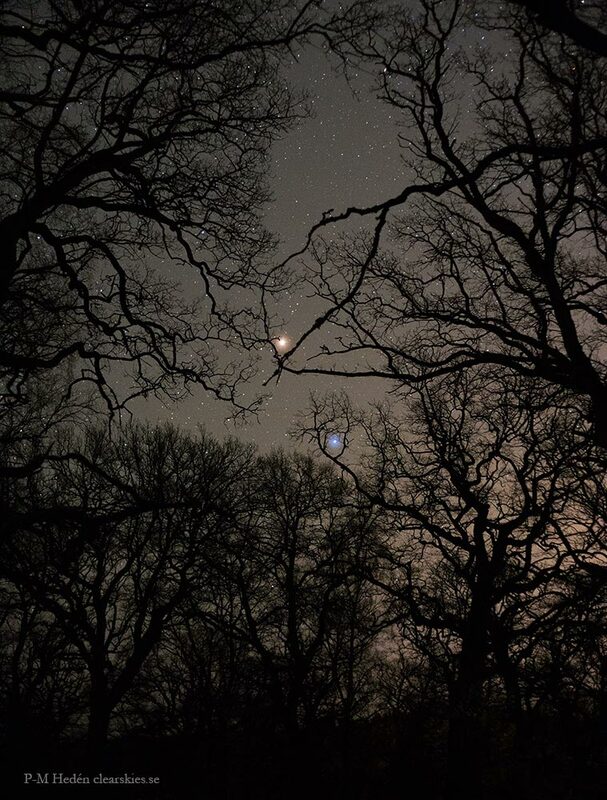 Pictured above, the planet and the star were photographed rising together toward the southeast after sunset last week through old oak trees in Sweden. Do you see the horse's head? What you are seeing is not the famous Horsehead nebula toward Orion but rather a fainter nebula that only takes on a familiar form with deeper imaging. 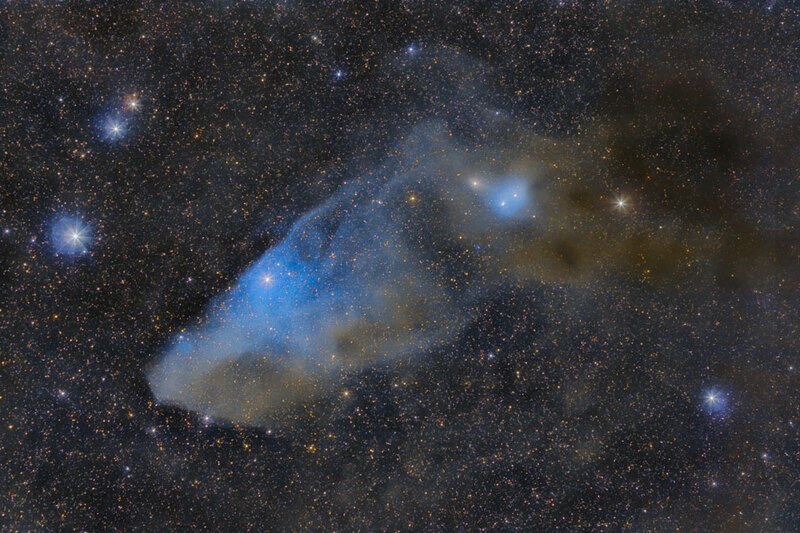 The main part of the above imaged molecular cloud complex is a reflection nebula cataloged as IC 4592. Reflection nebulas are actually made up of very fine dust that normally appears dark but can look quite blue when reflecting the light of energetic nearby stars. In this case, the source of much of the reflected light is a star at the eye of the horse. That star is part of Nu Scorpii, one of the brighter star systems toward the constellation of the Scorpion Scorpius. A second reflection nebula dubbed IC 4601 is visible surrounding two stars on the upper right of the image center. Volcano Tungurahua sometimes erupts spectacularly. Pictured above, molten rock so hot it glows visibly pours down the sides of the 5,000-meter high Tungurahua, while a cloud of dark ash is seen being ejected toward the left. Wispy white clouds flow around the lava-lit peak, while a star-lit sky shines in the distance. The above image was captured in 2006 as ash fell around the adventurous photographer. 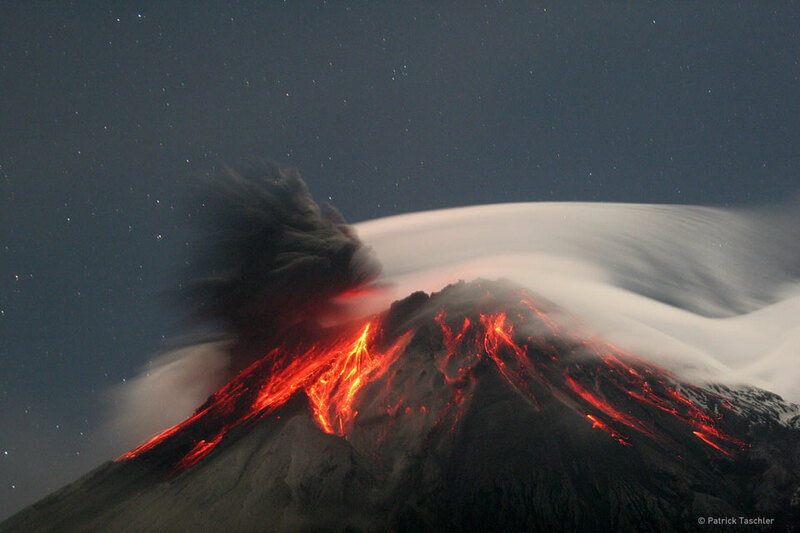 Located in Ecuador, Tungurahua has become active roughly every 90 years for the last 1,300 years. First flown in 1992, Endeavour, the youngest space shuttle orbiter, is being prepared for its 25th and final trip to low Earth orbit. Seen here from an exciting perspective 400 feet above the floor of Kennedy Space Center's Vehicle Assembly Building, Endeavour (OV-105) is mated to an external tank and solid rocket boosters just prior to roll out to launch pad 39A on March 11. The completed space shuttle stands over 18 stories tall. Intended for an April 19 near sunset launch on STS-134, Endeavour will head for the International Space Station and deliver the AMS cosmic ray experiment. The final flight of Endeavour will be the penultimate planned space shuttle flight. Nestled in the Austrian Alps, frozen Lake Ossiach stretches across the foreground of this serene view. Recorded on March 1, the night sky includes a nearly full Moon and bright planet Saturn seen through thin clouds near picture center. It also includes a remarkably bright and colorful moondog or paraselene at the left. 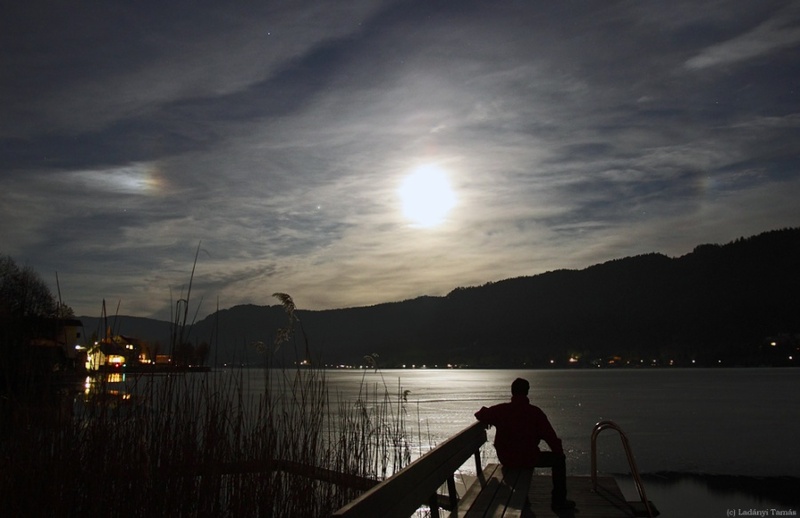 Analogous to a sundog or parhelion, the paraselene is produced by moonlight shining through thin, hexagonal-shaped ice crystals in high cirrus clouds. As determined by the ice crystal geometry, the Moon is 22 degrees from the lovely paraselene. Today, 100 Hours of Astronomy begins, a cornerstone project of the International Year of Astronomy 2009 celebrating the 400th anniversary of Galileo's original telescopic exploration of the sky. Running from April 2 through April 5, many different public programs are planned worldwide as part of the project, starting with today's opening event at the Franklin Institute in Philadelphia. Featuring one of Galileo's two remaining telescopes, the event will be webcast live. Of course, the sky examined by Galileo can still be appreciated today, with much more capable instruments that are widely available. But this skyward view from a private observatory in Veszprem, Hungary also includes objects Galileo did not see when he gazed into the night. Recorded on March 26, the image captures the paired trails of the International Space Station (the brighter trail) and the shuttle orbiter Discovery in low Earth orbit, as well as the streak of a passing airplane. 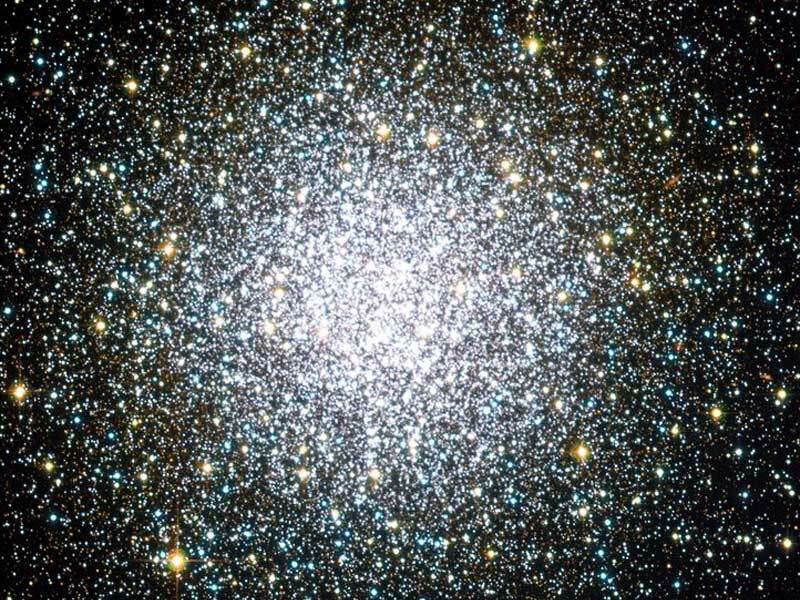 The fifty-fifth entry in Charles Messier's catalog, M55 is a large and lovely globular cluster of around 100,000 stars. Only 20,000 light-years away in the constellation Sagittarius, M55 appears to earth-bound observers to be nearly 2/3 the size of the full moon. Globular star clusters like M55 roam the halo of our Milky Way Galaxy as gravitationally bound populations of stars known to be much older than stellar groups found in the Galactic disk. Astronomers who make detailed studies of globular cluster stars can accurately measure the cluster ages and distances. Their results ultimately constrain the age of the Universe (... it must be older than the stars in it! 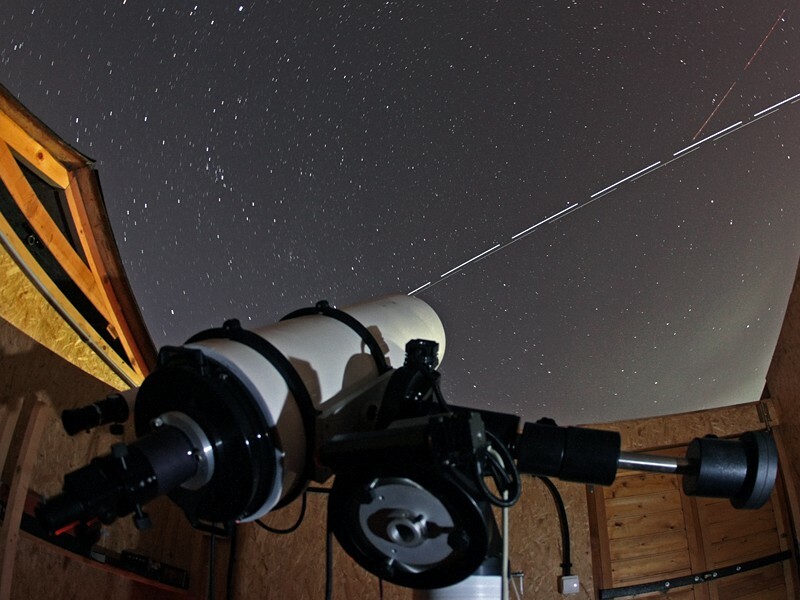 ), and provide a fundamental rung on the astronomical distance ladder. This stunning color image was made with the 3.6 meter CFHT telescope and spans about 100 light-years across the globular cluster M55. Why are there dark spots on the sun? Although noted for thousands of years, sunspots have been known for decades to be regions of the Sun that are slightly depressed and cooled by the Sun's complex and changing magnetic field. High resolution pictures like the above image from Japan's new Sun-watching Hinode satellite, however, are helping to increase modern understanding. In the center of the above image is a sunspot, but not seen in the usual orientation --this sunspot is seen sideways. 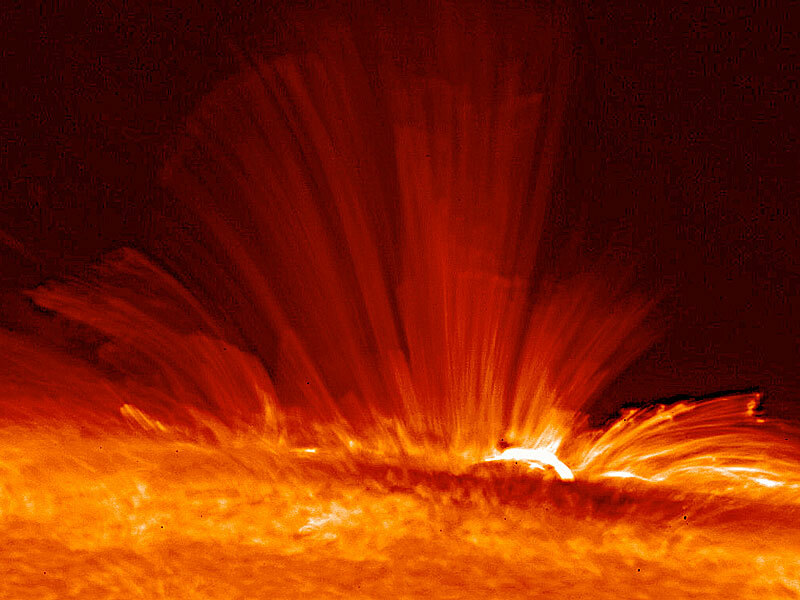 Of particular interest is erupting glowing gas that shows how the Sun's magnetic field comes right out of the spot center, but curves markedly around the spot edges. Better understanding of how the Sun ejects particles into space may result in more accurate predictions of solar storms that affect satellites, astronauts, and even power grids on Earth. The formation of a black hole from the collapsing core of a massive star is thought to be heralded by a spectacular supernova explosion. Such an extremely energetic collapse is also a leading explanation for the mysterious cosmic gamma-ray bursts. But researchers now suggest that the Milky Way's most famous black hole, Cygnus X-1, was born when a massive star collapsed -- without any supernova explosion at all. 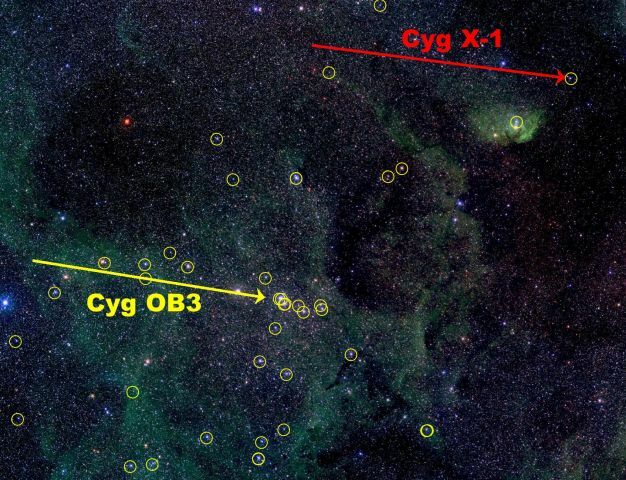 Their dynamical evidence is summarized in this color image of a gorgeous region in Cygnus, showing Cyg X-1 and a cluster of massive stars (yellow circles) known as Cygnus OB3. Arrows compare the measured direction and speed of Cyg X-1 and the average direction and speed of the massive stars of Cyg OB3. The similar motions indicate that Cyg X-1's progenitor star was itself a cluster member and that its path was not altered at all when it became a black hole. In contrast, if Cyg X-1 were born in a violent supernova it would have likely received a fierce kick, changing its course. If not a supernova, could the formation of the Cyg X-1 black hole have produced a dark gamma-ray burst in the Milky Way? Doing their part in the ongoing dance of the planets, Mercury and Venus both reached their greatest elongation or maximum apparent distance from the Sun only a few days ago, on March 29th. Eager to record their celestial accomplishment, astronomer Jimmy Westlake snapped this view of the two inner most planets shining in western twilight skies above Yampa, Colorado, USA. The picture was taken using a digital camera mounted on a tripod. Mercury is easily the brightest celestial object near the horizon, appearing to the right of the foreground structure and just above a thin cloud silhouetted by fading sunlight. Still, near the top of the picture brilliant Venus dominates the scene as the magnificent evening star. After climbing in western skies throughout the month of March, Venus lies just below the Pleiades star cluster. Tonight and tomorrow night, skygazers can spot Venus at the southern edge of the Pleiades. What caused this outburst of V838 Mon? For reasons unknown, star V838 Mon's outer surface suddenly greatly expanded with the result that it became the brightest star in the entire Milky Way Galaxy. Then, just as suddenly, it faded. A stellar flash like this has never been seen before -- supernovas and novas expel matter out into space. Although the V838 Mon flash appears to expel material into space, what is seen in the above four-frame movie is actually an outwardly moving light echo of the bright flash. The actual time-span of the movie is 8 months during 2002. In a light echo, light from the flash is reflected by successively more distant rings in the complex array of ambient interstellar dust that already surrounded the star. V838 Mon lies about 20,000 light years away toward the constellation of Monoceros, while the largest light echo above spans about six light years in diameter. What is causing the water in Florida Bay to turn black? The mysterious black color could be seen as early as last December in images taken by the SeaWIFS instrument on board the Earth-orbiting SeaStar satellite. 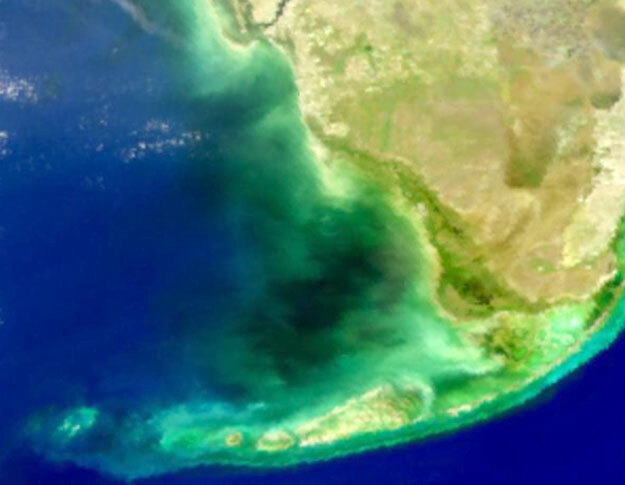 During the darkest period in February, when the above image was taken, visibility in the usually transparent/turquoise water dropped below three meters. Samples have been taken and are currently being analyzed. Early tests show the black water has normal salinity and oxygen and might be an unusual nontoxic algae bloom. Whatever the cause, the black water has real ecological and economic consequences, as normally abundant fish are completely absent. More recent SeaWIFS images show the black water to be breaking up into smaller pockets. Aurorae usually occur high above the clouds. The auroral glow is created when fast-moving particles ejected from the Sun impact air molecules high in the Earth's atmosphere. An oxygen molecule, for example, will glow in a green light when reacquiring an electron lost during a collision with a solar particle. The lowest part of an aurora will typically occur at 100 kilometers up, while most clouds usually exist only below about 10 kilometers. 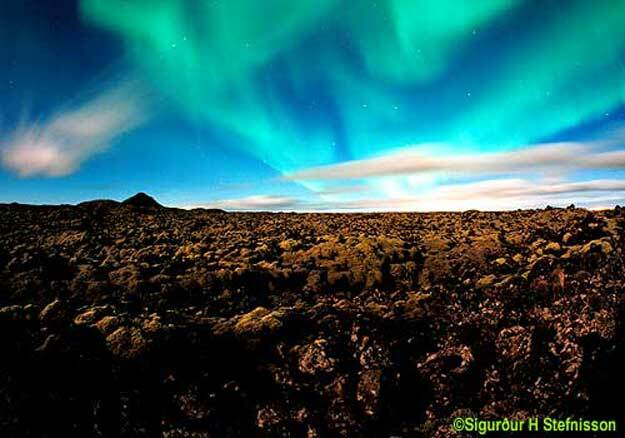 The relative heights of clouds and aurorae are shown clearly in the above picture from Iceland, where aurorae are relatively common. Over the past weekend, one of the largest sunspot groups ever recorded has been associated with explosive solar activity and expansive terrestrial aurora displays. Although in Earth's northern hemisphere aurorae are usually seen only in the far north, these aurorae were so prevalent they were imaged by a continuous nighttime camera operating in southern Arizona! Nestled within the dusty arms of the large spiral galaxy Andromeda (M31), the star cluster NGC 206 is one of the largest star forming regions known in our local group of galaxies. The beautiful bright blue stars of NGC 206 betray its youth - but close, systematic studies of variable stars in and around NGC 206 will also accurately reveal its distance. Astronomers are searching for variable stars in NGC 206, particularly pulsating stars known as Cepheids and eclipsing binary star systems. Distances for these types of stars can be effectively determined by following the periodic changes in their brightness and spectra. 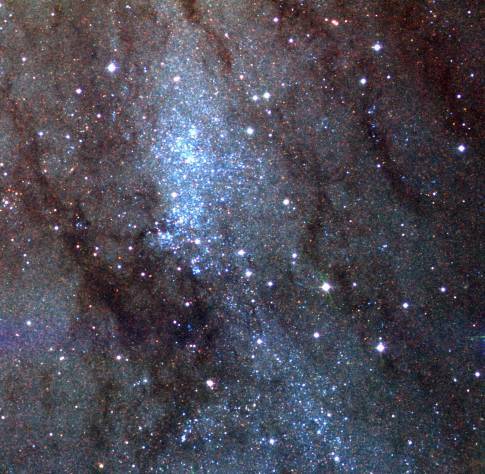 About 3 million light-years away, an accurately known distance to NGC 206 and thus M31 is critical to the larger understanding of galaxy formation, galaxy evolution, and ultimately the distance scale of the Universe. 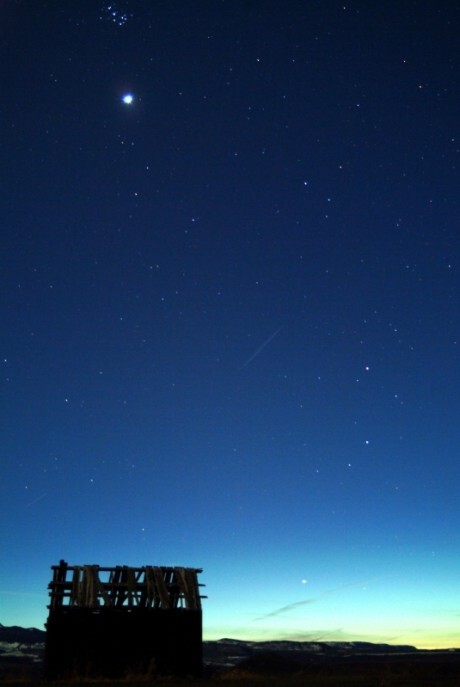 Have you seen an Iridium flare? Satellites in low Earth orbit reflect sunlight and are often visible gliding across early evening and predawn skies. But sun glints from Iridium commercial digital communications satellites are providing the most spectacular sightings. 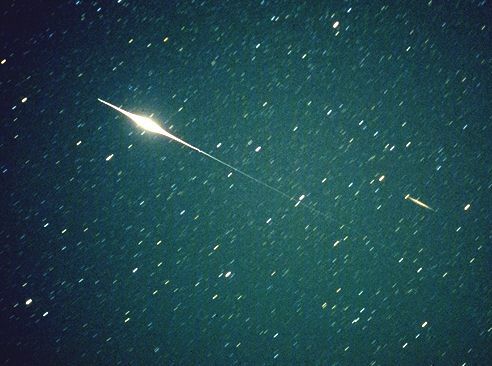 This Iridium flare photographed on September 20, 1997 by Belgian amateur astronomer Chris Dorreman reached an impressive -8 magnitude (about as bright as the half illuminated Moon). The one minute long exposure shows star trails nearly perpendicular to the bright, flaring track of the satellite and a "ghost" image of the flare at the far right. Iridium is the 77th element and so was a good name for the originally intended constellation of 77 satellites. Subsequently, plans were scaled down to 66 satellites with about 51 now in orbit and glinting away. Typical flares last 10 to 20 seconds. When can you catch a flare? The brightness, timing, and direction of a flare depend critically on your longitude and latitude, but satellite observers can make accurate predictions days in advance. Aurora frequently make complete rings around a pole of the Earth. This particular "crown", visible in orange near the top of this image, was taken by the orbiting Polar spacecraft about one year ago and released by NASA last month. A complete auroral oval is normally hard to photograph because part of it usually occurs over a brightly sunlit portion of the Earth. 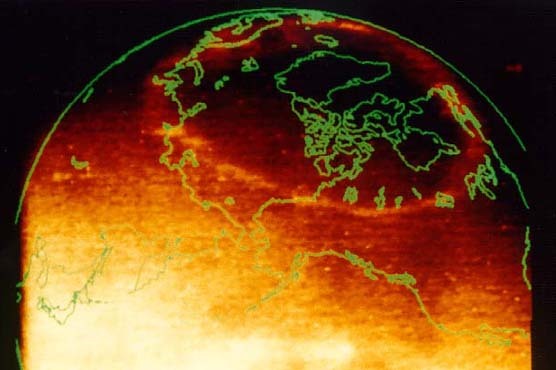 Polar's Earth Camera, however, can be programmed to filter out all but a certain type of ultraviolet light. In this "color", atmospheric oxygen can glow brighter than reflected sunlight. People with normal eyesight living near the Great Lakes in North America would have been able to see this aurora, were it not daytime! Imagine flying though space and approaching the Mir space station. The crew of the Space Shuttle Atlantis did just this in a mission that ended only two days ago. Mir, now 10 years old, is equipped for scientific experiments in astronomy, physics, materials, biology and chemistry. The top most module on Mir is an unmanned supply ship used to send food and supplies. The next module with the long boom carries telescopes and essential flight equipment and connects to the core module with living quarters and solar panels. To the left is the Spektr module carrying solar arrays and scientific equipment while on the right is a scientific module that also carries an airlock. 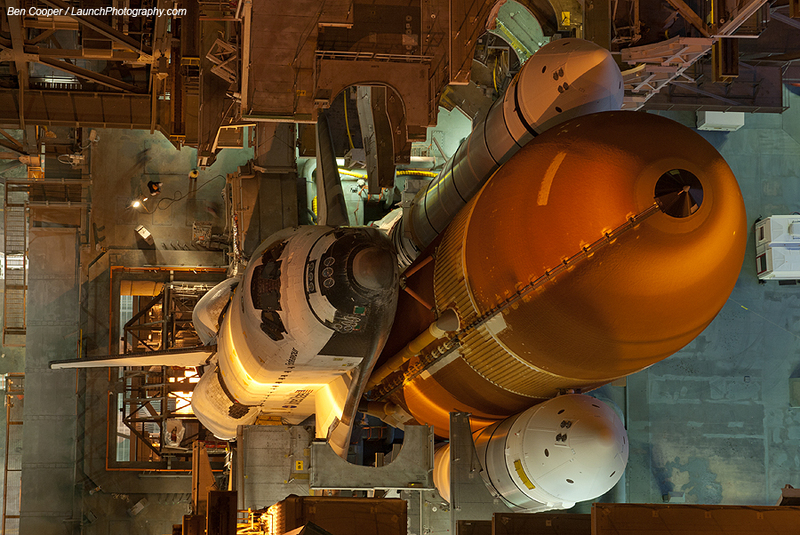 The docking module seen at the bottom is the ultimate destination of Atlantis. The STS-76 mission left astronaut Shannon Lucid for a planned five month stay. Four more shuttle flights are currently planned to Mir, keeping a NASA astronaut continuously in space until late 1997. In late 1997, building on this jointly developed understanding and experience, the US and Russia will launch the first modules of the International Space Station.